One of the benefits of being a LinkedIn premium member is that you can search for someone who might have worked with someone you’re researching. Perhaps you’re about to hire someone but would like to speak with someone else who knows your potential candidate because they worked together. Or maybe you’re about to enter a business deal and want some information from someone who knows your potential new partner. 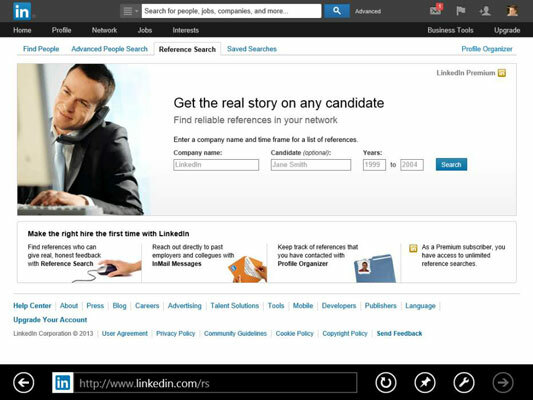 LinkedIn has created the reference search to give their premium users a better window into the person or company. All you need is the company name and the range of years someone has worked there, and LinkedIn searches your network and shows you the people who match that search and how closely they’re connected to you. 1Click the word Advanced at the top right of the LinkedIn home page next to the search box. 2Click the cog near the top right of the page (next to the Save Search link) to bring up a drop-down list, then select Reference Search. 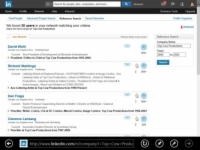 You will see the Reference Search page. 3Enter the name of the company and a date range. 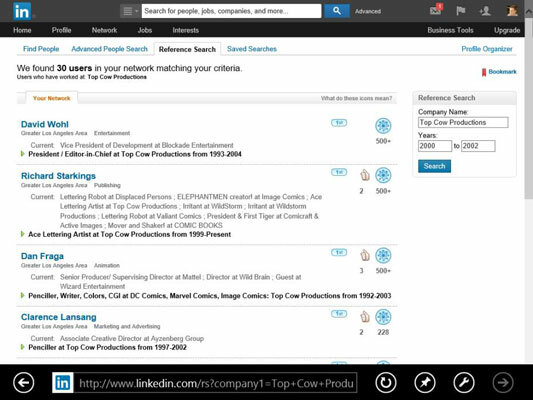 For example, suppose you have a job candidate who claims to have worked for Top Cow Productions from 2000 to 2002. You would enter that company name and date range into the text boxes provided. If you have the basic account, you see a Summary page like the one. This gives you an idea of how many potential connections exist and how many are available through LinkedIn’s InMail system. 5If you have a premium account, you would see a list of people (like in a name or job title search) who worked at the designated company in that timeframe, and you'd have the ability to contact them. The premium account makes verifying a reference much easier.